The project is funded by the Volkswagen Stiftung, via the “Science for sustainable development” call, and is hosted by Leuphana University Lueneburg. While it is increasingly clear that current use of the biosphere is violating planetary boundaries, existing analyses suggest that simply applying prevalent policy tools more resolutely will not suffice to fundamentally alter the trajectory of the Earth System. Instead, there is an urgent need to examine more deeply the root causes of unsustainability. One way to do so is to focus on hitherto under-recognized leverage points—places in complex systems, where a small shift can lead to fundamental changes in the system as a whole—that can foster more sustainable human-environment relationships. Leverage Points will be one of the first major projects worldwide to address the underlying, foundational issues of how of complex social-ecological systems can be transformed via such leverage points. The overarching goal of the project is to critically examine potentially important leverage points for sustainability that have received relatively little attention to date. To this end, we propose to study the re-structuring of institutions, re-connecting people with nature, and re-thinking knowledge for sustainability. Our genuinely inter- and transdisciplinary approach will identify new, concrete measures that can be taken to bring about urgently needed changes to current, unsustainable, human-environment relationships. Systems thinking is a useful way of conceptualising many sustainability challenges, in particular regarding the interrelationship between people and the environment. Complex systems are characterised by a series of first-order and second-order feedbacks, by self-organising behaviour, and by exhibiting higher-level emergent patterns resulting from lower-level interactions. It is our premise that one fruitful way to address sustainability problems is to analyse them as complex system problems. Much of the recent ground-breaking research within sustainability science using systems thinking has focused on quantitative systems modelling. In addition to quantitative modelling, there has been an emphasis on resilience-related concepts such as feedback loops, path dependency, lock-in, and stability. While quantitative systems modelling and resilience-related concepts are undoubtedly important to understand and solve some sustainability problems, Leverage Points will focus on another key aspect of system thinking which has received considerably less attention to date: How can social-ecological systems be purposefully moved onto more sustainable development trajectories through the use of leverage points? More than 25 years after “The Limits to Growth”, Donella Meadows had gained worldwide respect as a leading scientist in complex systems analysis for sustainability. Drawing on decades of personal experience, Meadows outlined a series of specific system properties that could be targeted to proactively change a given system’s overall behaviour (or even transform it entirely). She arranged these system properties, or ‘leverage points’, from those most readily altered but relatively weak, to those more challenging to alter, but extremely influential (Fig. 1). Figure 1. Meadows’ shallow and deep leverage points. A key premise of Leverage Points is that most measures applied in the service of sustainability to date have targeted system properties of relatively weak leverage. For example, much of the work on food security has focused on issues of food production and distribution, depicted as material flows and buffer stocks, rather than deep issues related to system goals and the power to change the rules of the system. Leverage Points will study not only the importance of deep leverage points (i.e. where to apply pressure), but will consider the effectiveness of particular ‘levers’; that is, specific measures by which pressure can be applied to a given leverage point. We note that while the analogy of levers and leverage points as places to intervene in a system may imply simple mechanistic relations between a given lever and system change, we are acutely aware that no such simple mechanistic relations exist. 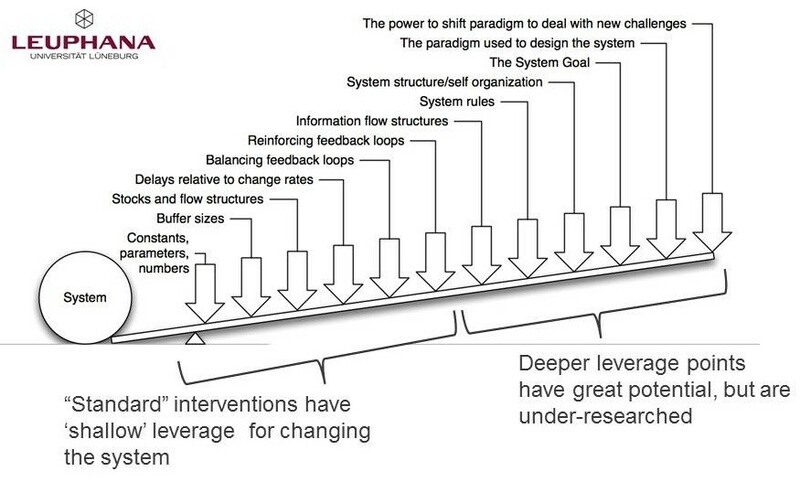 The different leverage points are not independent, and system changes resulting from the application of a given lever may be complex and unexpected. We will apply a diverse suite of methods from the social and natural sciences, including quantitative and qualitative reviews; stakeholder analysis; interviews, focus group discussion, participatory and transdisciplinary methods, spatial modelling, scenario planning, and case surveys. The role of specific levers will be studied in two case study regions in contrasting settings (Transylvania in Romania and Lower Saxony in Germany), and will focus on two thematic fields highly relevant to sustainability (food and energy; see). Specifically, we hypothesize the need to act on three key leverage points: (1) RESTRUCTURE institutional arrangements; (2) RECONNECT people with nature; and (3) RETHINK how knowledge for sustainability is created and acted upon. Insights from these leverage points will feed into two transdiciplinary case studies (one in each of the study regions). RESTRUCTURE, will address changes in institutional arrangements relating to the rules of the system and the power to change the system. Social structures embodied in institutions (rules, regulations and policies) enable, constrain and guide human action and thus are of central concern to sustainability transformations. Different from most existing research, Leverage Points will not only consider institutional innovation and ‘successful’ institutional arrangements, but will specifically investigate what can be learnt from institutional failure (e.g. the failed European emission trading system), and assess how purposeful institutional decline could foster sustainability (e.g. abolishing unsustainable commuting tax allowances). RECONNECT, will specifically investigate connections, disconnections, and possible re-connections between people and ecosystems. This lever is concerned both with material flows of the benefits that people obtain from nature (ecosystem services), but also with the mindsets, attitudes and paradigms underpinning those flows. Leverage Points will ask, for example, how more or less close connections of individuals and communities with ecosystems results in different development aspirations and consumption or land use patterns. RETHINK, will explore forms of knowledge production and use for facilitating sustainability transformations. Modes of thought and discourses will be analysed against the background of context conditions, including socio-cultural, economic, and political-historical factors. Leverage Points will empirically investigate different modes of knowledge creation in two contrasting regions. Insights regarding new forms of knowledge creation (and use) will be developed and explored as fundamental levers for sustainability, for example, the stronger collaboration between scientists and local actor groups in real world laboratories for sustainability transformation. The two case studies will start from concrete local problem constellations in order to carry out two ‘ideal typical’ local transdisciplinary research projects within the study regions. There will be a focus on co-design of the research object and co-production of transferable knowledge, as well as on the integration and validation of the insights gained within the RESTRUCTURE, RECONNECT and RETHINK domains. The major goals of the transdisciplinary case studies are: (i) to better understand how to identify and use interconnected levers for sustainability transformations in different real-world contexts; and (ii) to contribute to concrete sustainability transformations in the case study areas and beyond. Our systemic approach will bring together currently fragmented findings from diverse fields within sustainability science. The leverage points will be examined both individually, and with regard to their interlinkages. In doing so, Leverage Points will be the first study of institutional change, human-nature interactions and knowledge creation using a shared and coherent systems approach. This will generate new, integrated conceptual and empirical insights into the role of deep leverage points for sustainability. Details on the indvidual work packages can be found here.